An attorney from WilmerHale appeared in early September on behalf of the Reporters Committee for Freedom of the Press and a coalition of 24 media organizations to urge the Court of Justice of the European Union (CJEU) to rule that a French data privacy authority can’t require Google and other search engines to apply the so-called “right to be forgotten” worldwide. Also known as delisting, the right to be forgotten — approved by Europe’s high court in 2014 — allows European Union (EU) citizens to ask search engines to remove links to certain results that appear when looking up their name. In an argument before the CJEU on Sept. 11, and in a friend-of-the-court brief submitted in November 2017, the Reporters Committee explained that forcing search engines to take down links worldwide that have been delisted in the EU would inhibit journalists’ and the public’s access to news and information. The brief noted that one-third of the 31 dereferencing demands the French data privacy authority — Commission nationale de l’informatique et des libertés (CNIL) — sent to Google in an April 2015 letter sought to delist news articles. Demonstrating the importance of fighting attempts to censor these platforms, the brief also cited polls in the U.S. and Europe showing that approximately one in five respondents said they used search engines as their primary method of accessing news. “By providing access to the work of journalists and news organizations, search engines serve fundamental values of free expression, debate, open discourse, and greater exchange of ideas,” the Reporters Committee noted in the brief, adding that search engines are a crucial method for journalists to find information for news stories. The CNIL argued that potentially damaging information about a person, such as past criminal wrongdoing for example, should eventually disappear from search engines if the person has paid their debt to society. Frédéric Louis, a partner at WilmerHale’s Brussels office and the lawyer who argued the case for the Reporters Committee, said this approach would create an imbalance between rights. “We and others have tried to tell them that they are giving too much weight to data protection and not enough to other competing basic human rights, like freedom of speech and freedom of information,” said Louis. Louis also explained that worldwide delisting of links taken down in the EU would give increased power to governments in countries such as Russia and China that already repress the free flow of information, an argument the Reporters Committee echoed in its brief. Allowing the EU to mandate delisting worldwide essentially gives autocratic governments a ready-made excuse for controlling sensitive information, Louis said. In their arguments against worldwide delisting during the Sept. 11 hearing, attorneys for Google noted that the company has a 99.96 percent success rate at preventing users within a specific territory from accessing information on its platform that has been blocked for that location. Louis said the high success rate raises the question of whether there is any justification to require global delisting given the restrictions it would place on First Amendment rights worldwide. WilmerHale D.C. partners Patrick Carome and David Bowker, and WilmerHale Frankfurt partner Hans-Georg Kamann were also deeply involved in the case along with Louis. Carome, who attended the CJEU hearing, said there were notable differences in how the European and U.S. courts function, including the court’s composition and how it examines cases. Among the divergences, Carome noted, were a lack of questions from the 15 judges — which he said outnumbered the judges that hear oral arguments in U.S. courts — and the presence of the Advocate General, who provides a non-binding opinion on how the CJEU should rule before the court issues its official opinion. Louis noted that only three of the judges asked questions of the parties appearing before the court, none of which were directed to him during the approximately 18 minutes that he argued throughout the more than six-hour hearing. The short amount of time allotted for Louis’ arguments on behalf of the Reporters Committee was in part due to the large number of other parties involved in the case who also appeared before the court. These parties included the Wikimedia Foundation, Fondation pour la liberté de la presse, Microsoft, Article 19, the Internet Freedom Foundation, six EU member states and the European Commission. For the Reporters Committee, media coalition and WilmerHale, it was a long road to the CJEU. The Reporters Committee first got involved in the case when it rallied a media coalition to send a letter to the CNIL in 2015 expressing concern over the data privacy authority’s order that Google implement worldwide delisting of links taken down in the EU. When Google appealed that order to the French Council of State, the Reporters Committee and a coalition of nearly 30 media organizations submitted a friend-of-the-court brief in support of Google. Because the media coalition was granted intervenor status in that case — allowing the group to join the ongoing litigation — it was also allowed to file a brief and participate in oral arguments when the case was later referred to the CJEU. Carome said WilmerHale’s support of the media coalition was a trans-Atlantic effort, bringing together resources from the firm’s offices in Brussels, Frankfurt and Washington, D.C. Along with the global delisting case, the CJEU has another upcoming decision that could have significant consequences for First Amendment rights. That case examines whether Google must automatically take down links to search results containing certain sensitive data about individuals, such as their criminal records or political beliefs, or whether Google can continue to balance the public interest in access to information with the individual’s right to privacy in deciding delisting requests. Louis explained that a decision by the CJEU to both apply the right to be forgotten worldwide and rule that Google must take down links to sensitive data without considering the public interest in access to the data would create a much more censored internet landscape. The CJEU is expected to render a decision in both cases in 2019. The full brief filed by the Reporters Committee and media coalition can be found here. 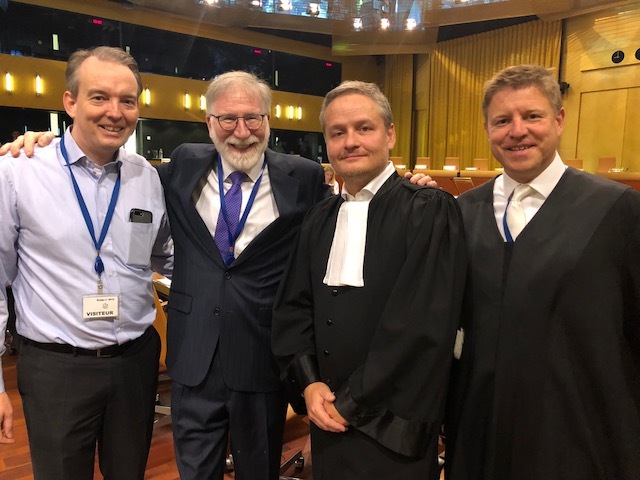 Pictured: WilmerHale partners Martin Braun (Frankfurt office), Patrick Carome (Washington, D.C. office), Frédéric Louis (Brussels office) and Hans-Georg Kamann (Frankfurt office) in the courtroom prior to the Sept. 11 argument before the CJEU.